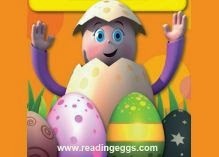 I've heard so many great things about the Reading Eggs program, so when they asked me to check them out and offer my readers a free 5-week trial, I could not pass it up (this offer is only good until the end of September, then it's a 2-week free trial). No credit card required! This program has been developed by terrific team of teachers, educational writers, animators and web developers so it's perfect for kids and a lot of fun. · Since launching in the United States and Canada in 2011, Reading Eggs has signed on more than 500,000 subscribers and presented more than 15 million lessons in North America. Here's a great press release about how great online games are for teaching kids how to read! Check it out! I'll be doing the same!